This twisted infant and toddler hairbow is made with 7/8 inch ribbon in your choice of over 20 colors. 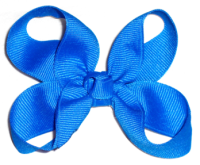 Also visit our hairbow sets and get this bow in a set of 3! Add velcro to this bow to prevent slipping.